I am having a wonderful time finding new ways to GREEN my laundry routine. So when SmartKlean recently contacted me to see if I would be interested in trying their Laundry Ball…OF COURSE I WAS! The SmartKlean Laundry Ball is not only Earth-Friendly, it saves you money AND is super easy to use. I love anything that makes doing chores easier. How does it work to clean my clothes without using detergent? Answer From SmartKlean: The laundry ball is filled with many ceramic beads, each comprising a combination of different minerals. When these ceramic beads come in contact with water, they form oxygenated water. The water molecules are fragmented into smaller sizes, increasing the water’s dissolution power and enabling better penetration into the fabric’s pores, therefore releasing dirt, grime and odors. How long does a laundry ball last? Wow! That is amazing! But – at my house, I do at least a couple loads laundry almost every day. How do I know when to replace my SmartKlean laundry ball based on my own personal usage? Answer from SmartKlean: Use the Laundry Ball Lifespan Chart on the SmartKlean website. It will tell you everything you need to know, based on your personal laundry schedule and washer capacity. It will even tell you how much and how often you should expose your laundry ball to sunshine. WHAT?! What do you mean, expose my laundry ball to sunshine? Answer from SmartKlean “How It Works”: The laundry ball is simply placed among the laundry in the washing machine. It may be left in the machine for the next load. All that is required is a monthly sun bath for 1-2 hours to regenerate the ceramic beads in order to keep it working at full force! *In addition, since it doesn’t use chemical detergents, there is no need to use the rinse cycle. *No phosphates, No chlorine, No chemicals! *4 kinds of ceramics in the ball and magnets that work together to get clothes clean with every wash.
And didn’t you say something about a SmartKlean Laundry Ball being economical, too? Answer from SmartKlean: Less waste, packaging, electricity, no need to buy detergents = You save money! I found it extremely easy to use the SmartKlean laundry ball. I loved that I could simply leave the ball in the washer, ready at any time for the next load! The SmartKlean laundry ball did get our clothing clean. I didn’t have any super stained items in the wash this past week – but their website did say that laundry with tough stains may require pretreatment to ensure the stain comes out. The use of stain treatment products will not affect the laundry ball’s performance. Your clothes will come out of the washer clean and without a smell. *Tip: If you enjoy having laundry that smells good when clean, you may wish to use essential oils when you wash your clothes with the laundry ball. There is the upfront cost ($45) of purchasing a SmartKlean Laundry Ball…but, let’s do the math: One ball lasts 365 washes, eliminates the need to buy detergents, fabric softeners, and dryer sheets, plus saves electricity and water, plus all the Environmental and Health benefits – this equals out to be a great way to GREEN your laundry routine AND save money. To learn more about the SmartKlean Laundry Ball, visit the SmartKlean website. Purchase a SmartKlean Laundry Ball! It’s 100% satisfaction guaranteed! SmartKlean Laundry Balls are only available for purchase online via their website and distributors. Click Here to Buy Now Through the special Mom Always Finds Out link and Get FREE SHIPPING on your order. Please note this special link and ongoing Free Shipping discount is only available through this link and is not accessible through SmartKlean’s main page navigation. Visit the SmartKlean blog for tips on green living. Connect with SmartKlean on Facebook and Twitter. Disclaimer: I received a SmartKlean Laundry Ball free of charge for review purposes. All opinions expressed here are honest and based on my experiences with the product. This site and blog post contains affiliate links. Previous Post: « I LOVE MY MOMMY #Giveaway Blog Hop! Enter Here May 5-10! Oh this is sooo cool! I wish there was something like this for diaper laundry! But, the laundry balls are supposed to be effective for diaper laundry too. any readers out there with insight on this topic, feel free to comment! I love your website!! I also purchased the laundry ball and have been using it for the past 2 months or so now. And it does get my laundry clean! I still need to use some Eco friendly bleach on the whites and just as much pre stain treated as before but it’s amazing that they get clean without having to use soap!! I was wondering though if you have noticed any more ‘wear’ on clothes, jeans? I don’t know if it’s just me or what but it seems like my clothes are softer but almost too soft? It is a pretty big ball with some bumps, I wonder about it. Does it work on all colors, fabrics? What about temperature? I like keeping my clothes soft, does the laundry ball also soften clothes? Yes, the SmartKlean ball works on all colors and fabrics. It is not recommended for use in hot water so as to avoid damaging the ceramic components of the ball. You can even use it to handwash your delicates (see their site for directions). Thank you for your question. I love using my SmartKlean ball and highly recommend it to anyone. It works great and eliminates the need to buy detergents and softeners. I am wanting to order this and try. I have the Kenmore Elite HE3 front loading washer. How many balls should I use per load? The amount of balls you should use per load depends on the weight of your laundry. According to SmartKlean’s site, you should use 1 laundry ball for every 18 pounds of laundry you put into the machine. In my opinion, small loads should be fine with 1 ball, but for large loads, you would need to use at least one or more balls. I hope that helps, please let me know if you have further questions and I will be happy to help you find answers. Thank you for your blog post comments (I read them all, but am just responding here.) I’m so glad you enjoy reading my blog posts, I hope you will stop by again soon. About the laundry ball – I do not use this ball anymore. It lived its recommended life span and I did not buy another one. It did seem to work and made the laundry easy to do since I just had to put a ball in there and run the load. 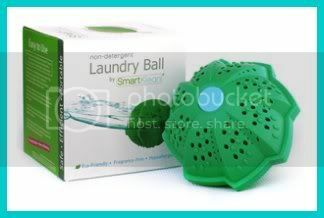 I have also tried another type of laundry ball that you can refill with detergent balls (called the Robby Wash ball). I liked that one too. I’m currently making my own laundry detergent and am happy with the results and think that is the cheapest way to do laundry (only 2 cents per load!). I’m so glad you like the magazine tree idea – I made several of those too – they are fun! Definitely going to try this one out! I have a lot of delicates though so use a mesh bag to hold them while washing… not sure if that will affect the performance of the ball. Very Interesting. I have use Washing Ball and i feel good without using washing powder my clothes to small fresh and Clothes nice smells.